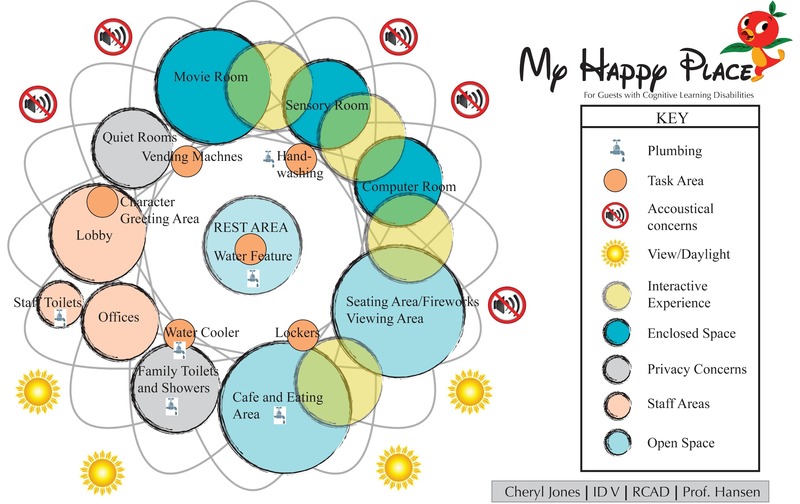 My Happy Place facility is an autistic facility set within a theme park. 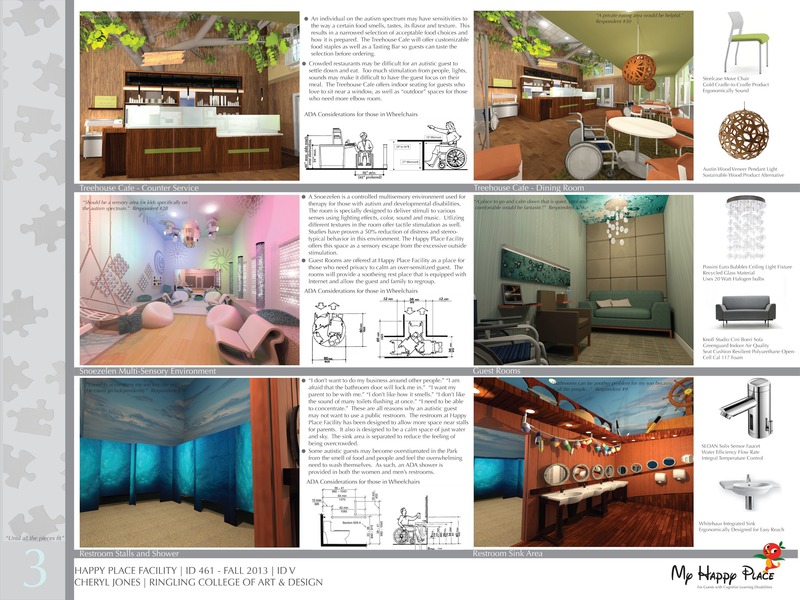 This was a Senior Year Social Design Solution Project. 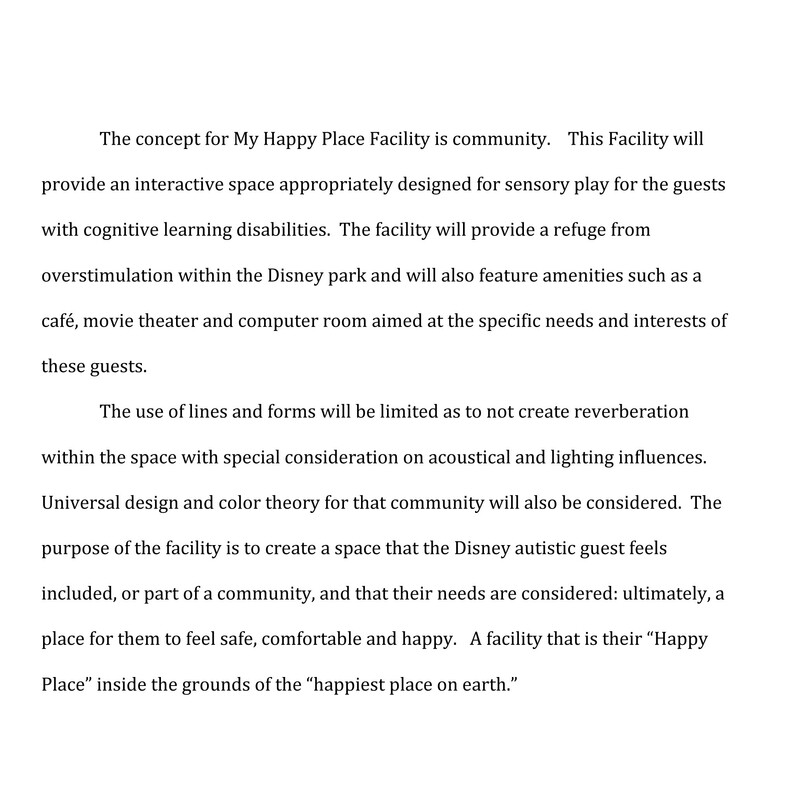 Concept Statement for My Happy Place facility. Presentation Board #1 for My Happy Place Facility - All quotes are actual responses from parents who participated in the survey questionnaire. Presentation Board #2 for My Happy Place Facility - All quotes are actual responses from parents who participated in the survey questionnaire. Presentation Board #3 for My Happy Place Facility - All quotes are actual responses from parents who participated in the survey questionnaire. 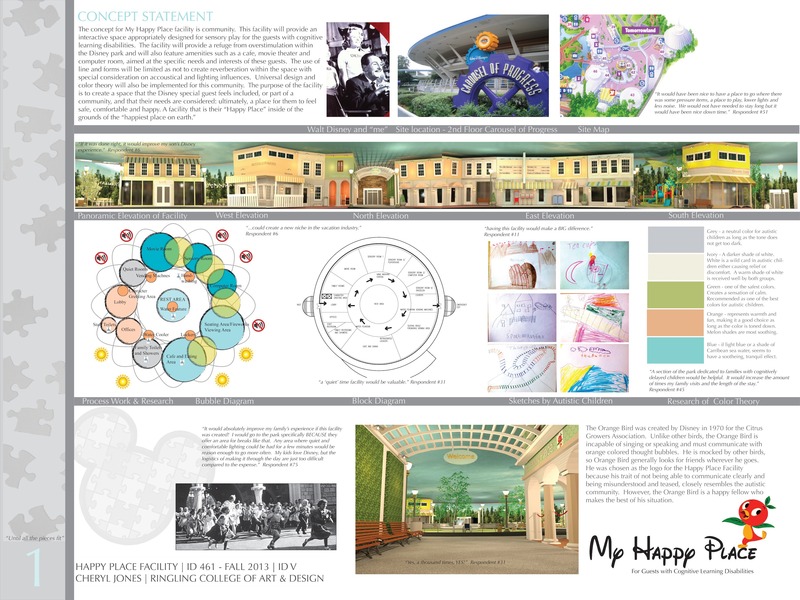 Presentation Board #4 for My Happy Place Facility - All quotes are actual responses from parents who participated in the survey questionnaire. 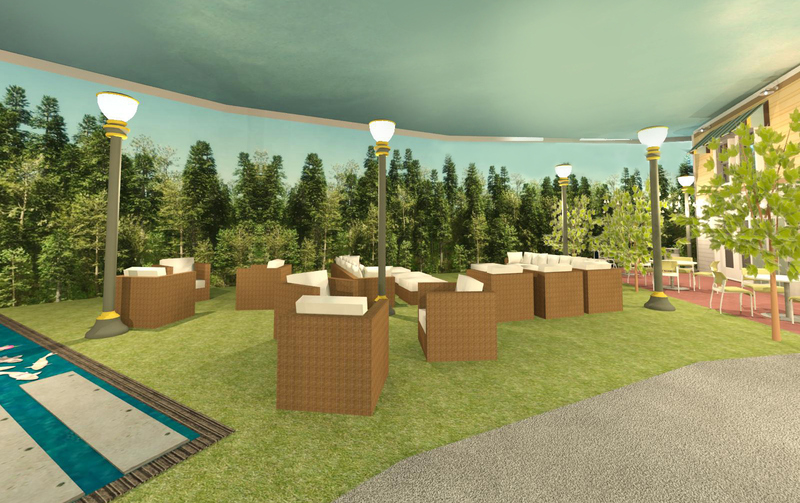 Treehouse Cafe - special consideration was taken with customizable food, a tasting bar, accoustical considerations, low lighting, color theory applied and indoor and outdoor seating available - all within a lightly themed space. Wheelchair accessibility has been considered in space planning. 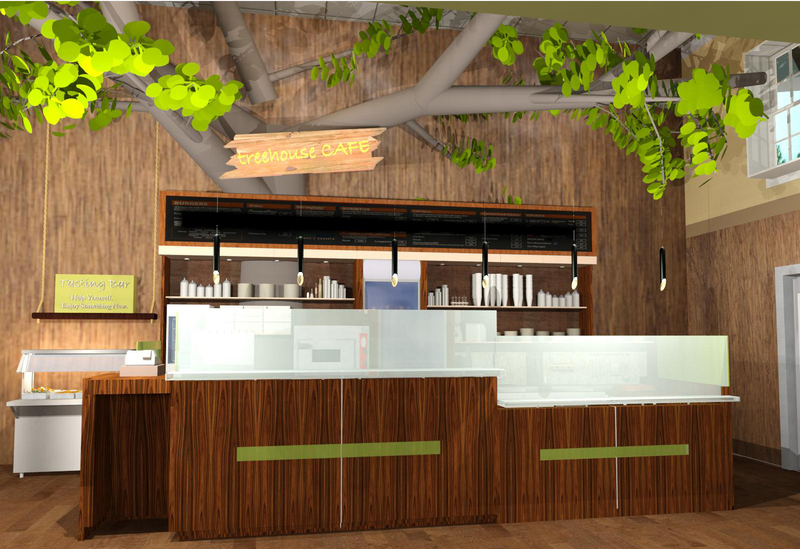 Treehouse Cafe - Access to customized food options with a tasting bar available so guests can taste before purchasing. Wheelchair access is considered at checkout area and with lowered height counter. Guest Rooms so a family can calm a child who is overstimulated within a private space. Special considerations on accoustical properties and low lighting. The space is intimate with a peaceful theme of water that has internet access and wheelchair accessibility. 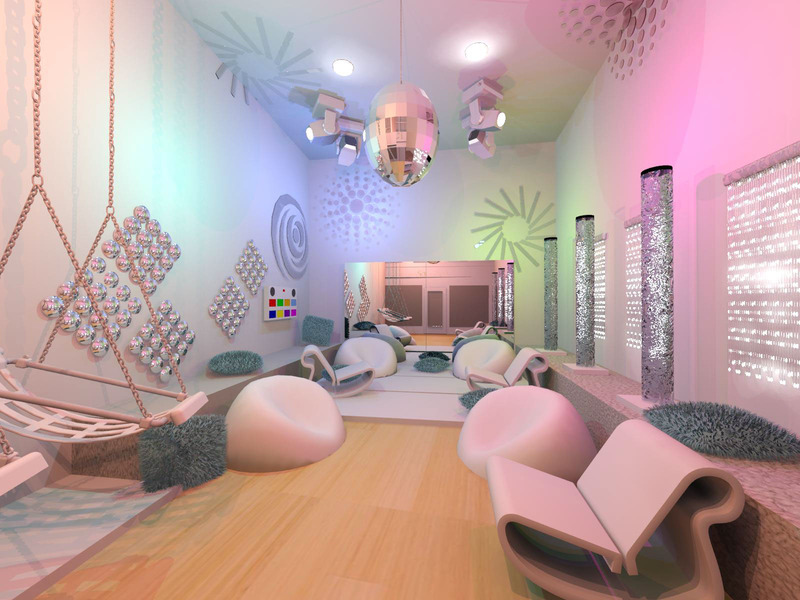 Multi-sensory room (snoezelen) specially considered for autistic guests who need sensory stimuli for feeling safe and comfortable. Special considerations in this room are accoustical, lighting, sounds, wheelchair accessibility and varied areas of stimulation for those with rocking tendencies. 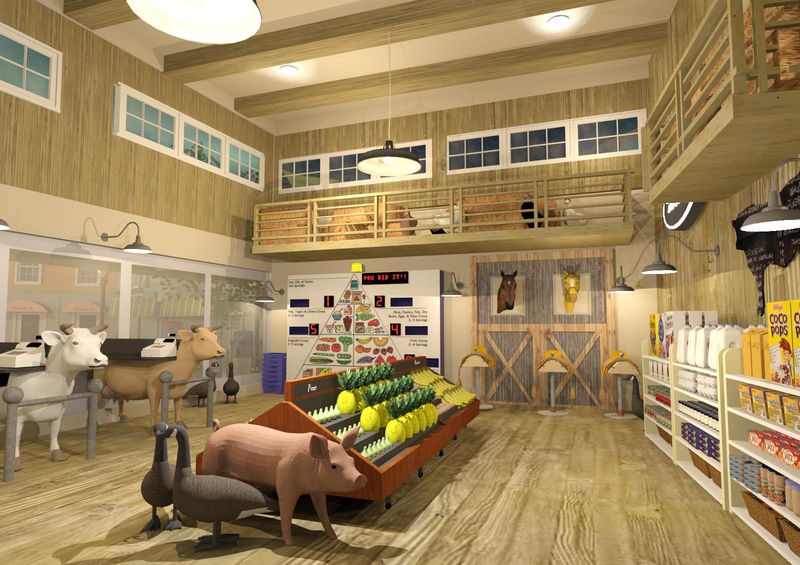 Hayloft Country Store - Sensory Room themed as a barn grocery store. 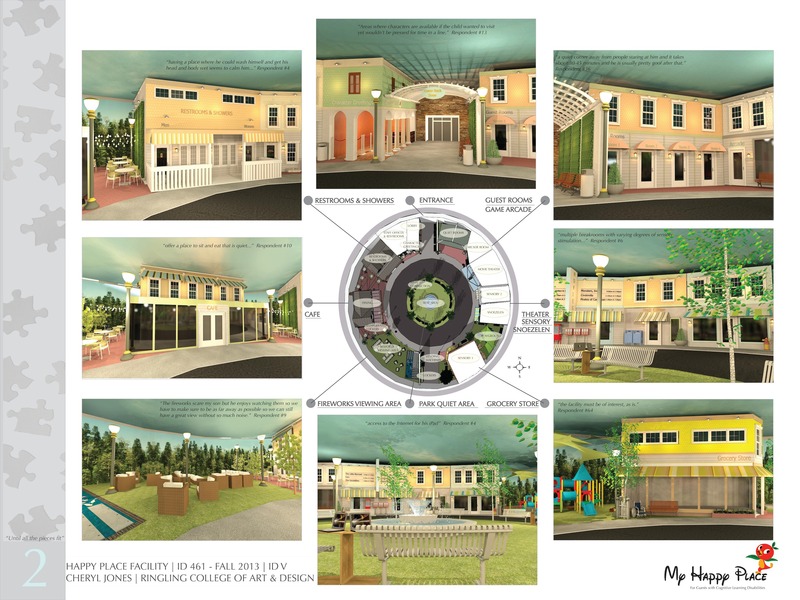 The area is equipped to give the guests a familarity of the space but to also teach about healthy food choices. As well as offer an introduction to where our food comes from. 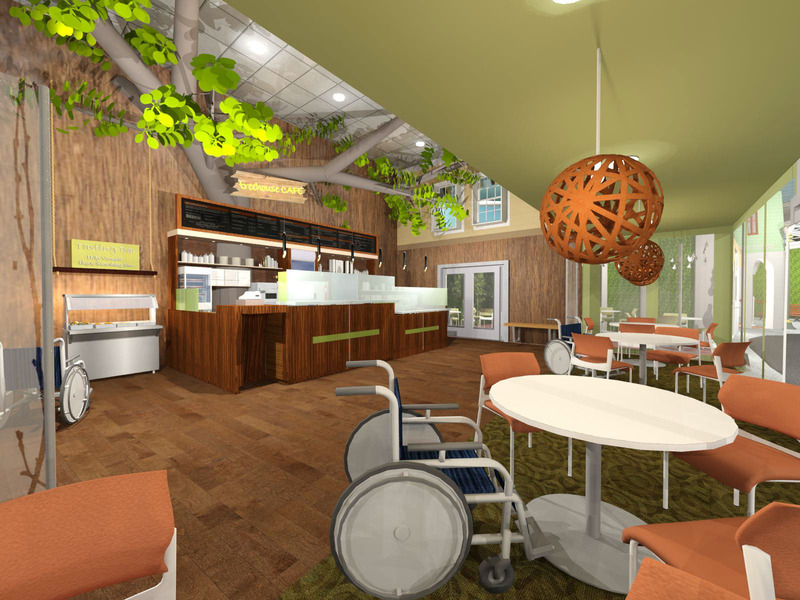 Special considerations were placed on wheelchair accessibility, reach considerations and keeping design as authentic as possible. 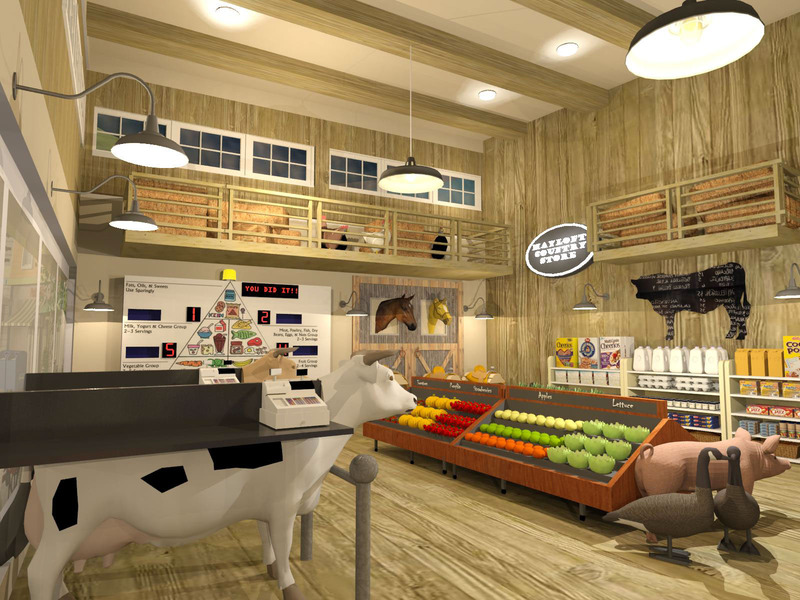 Hayloft Country Store - Equipped with a food pyramid game at rear of space that gives reinforcement on what types of food product and the amount needed per day for a healthy lifestyle. As many autistic children are picky eaters and overweight, this game is intended to give the guest knowledge in a fun atmosphere. 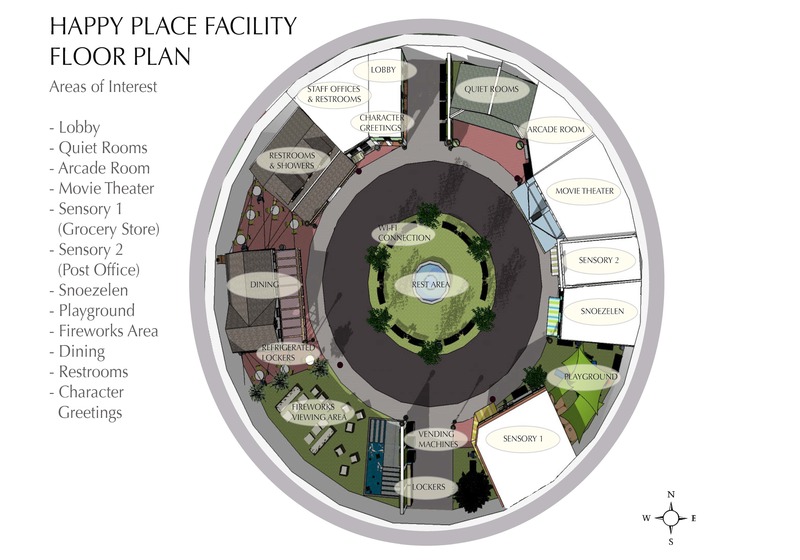 Hayloft Country Store - A sensory area with rice and bean bins have been provided. This type of sensory play is a popular one in the autistic community and requested by several parents responding to the survey questionnaire. 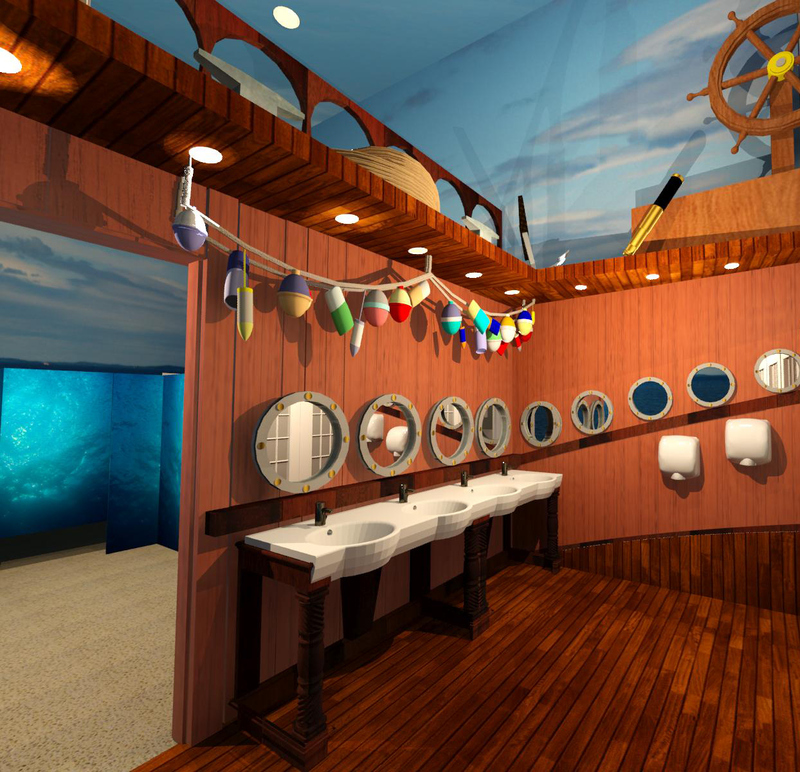 A themed restroom of the inside of a ship keeps the guest interested in proceeding to the stall area. Autistic children have expressed dismay at having bathrooms feel too crowded so the sink area and the stall area have been separated by appearing to be the inside of a ship on the sink side and the ocean on the stall side. Special consideration was implemented with the integrated sinks and no-touch faucets that are temperature regulated. Low lighting was implemented throughout the restroom. 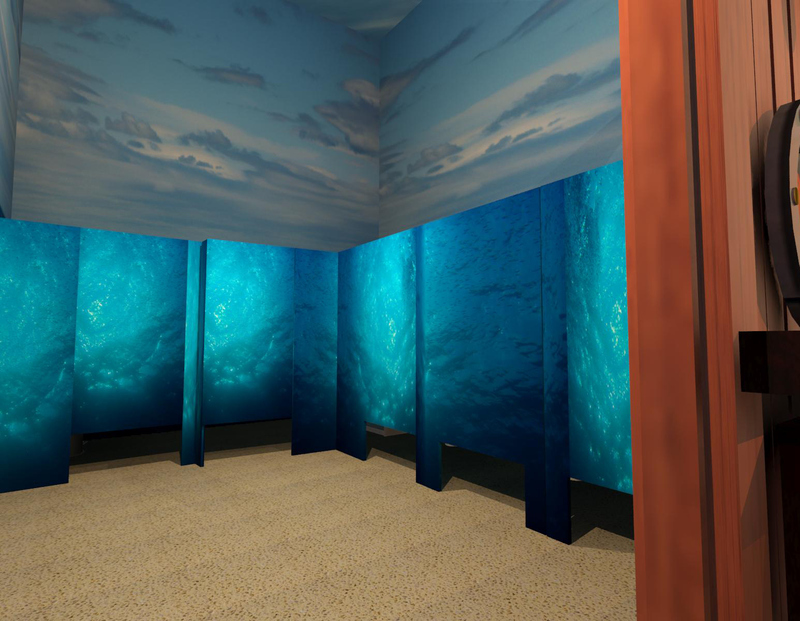 The ocean side of the restroom was created as a peaceful space and to not distract a guest from using the facility with too much stimulation. 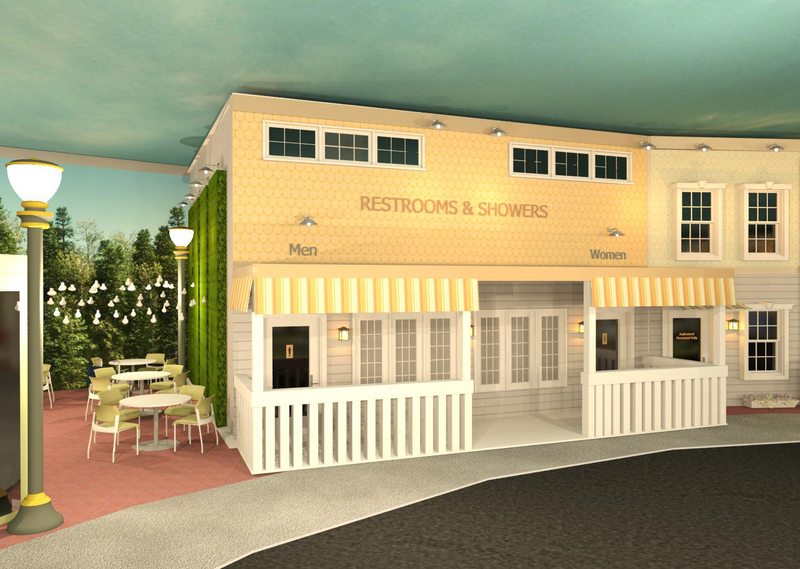 The center stall provides a shower area for guests that are sensitive to smells within the Park and feel the overwhelming need to wash themselves clean. Special considerations were made for the bathroom stalls to be ADA compliant and the shower stall to provide ample room to accomodate a wheelchair guest. Also, the stall area provides plenty of space for parents to accompany their children if they cannot use the restroom without assistance. Entrance to my Happy Place Facility. 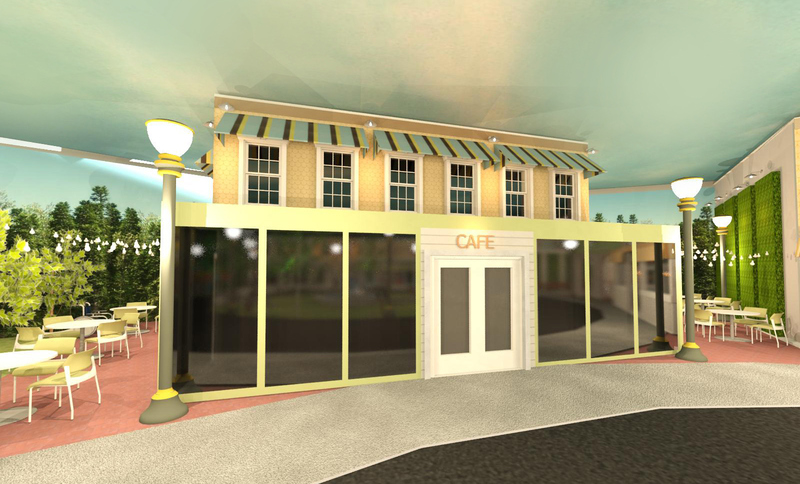 The facility has been themed to represent a small community or town. Keeping the space familiar to most guests is a way to ease fears and provide a place they feel safe and comfortable. Low lighting is a special consideration in this space. 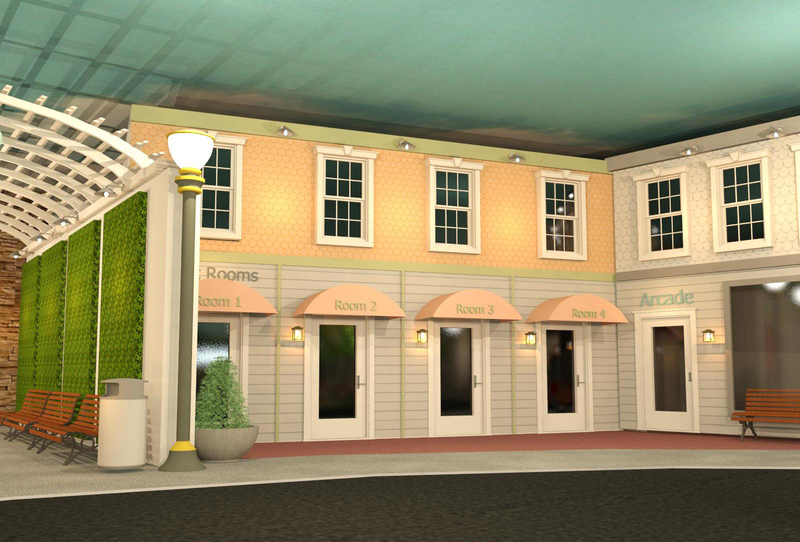 Guest Services are located inside the entrance to accomodate whether the guest needs a private room or has any questions regarding the facility. 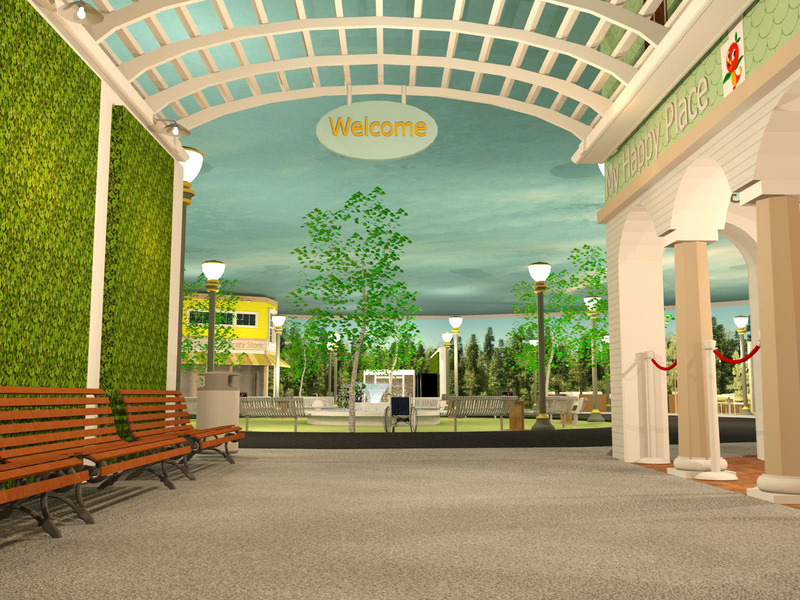 Exit to My Happy Place Facility showing Character Greeting area. The characters would have special training in handling the autistic guest. Guest Rooms are available for families in need of a private area for a short time. The Arcade is equipped with traditional games such as pinball and video games but also have stations of computers for family--friendly computer games. Two theaters are located in My Happy Place Facility that continually play movies throughout the day. 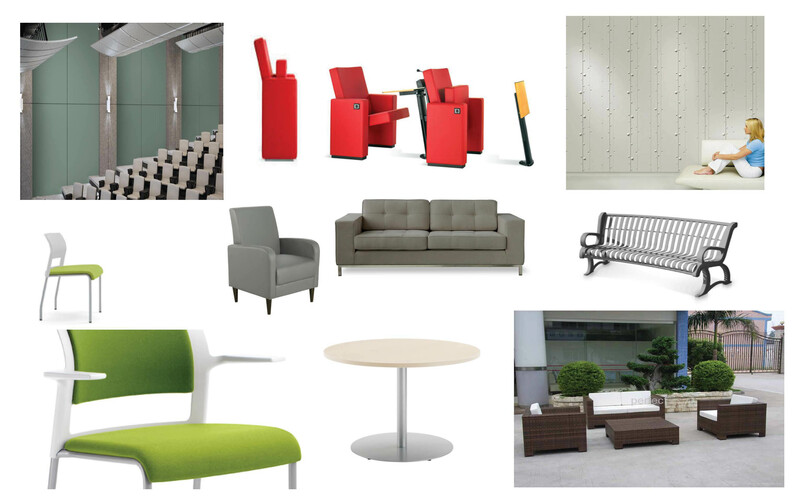 Special considerations were made in accoustical and lighting elements in the space. The Post Office is a sensory room that children play in a mock environment of a US Post Office. The Snoezelen is located directly next to the post office and features sensory stimulation through lighting, sound, and touch. 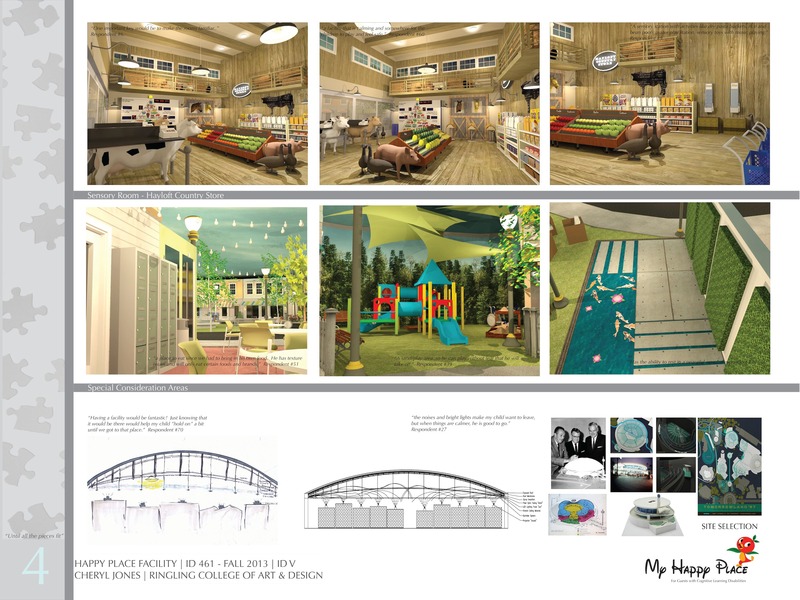 An indoor playground is provided with sandboxes for sensory play. One sandbox has been elevated for table play for guests in wheelchairs. 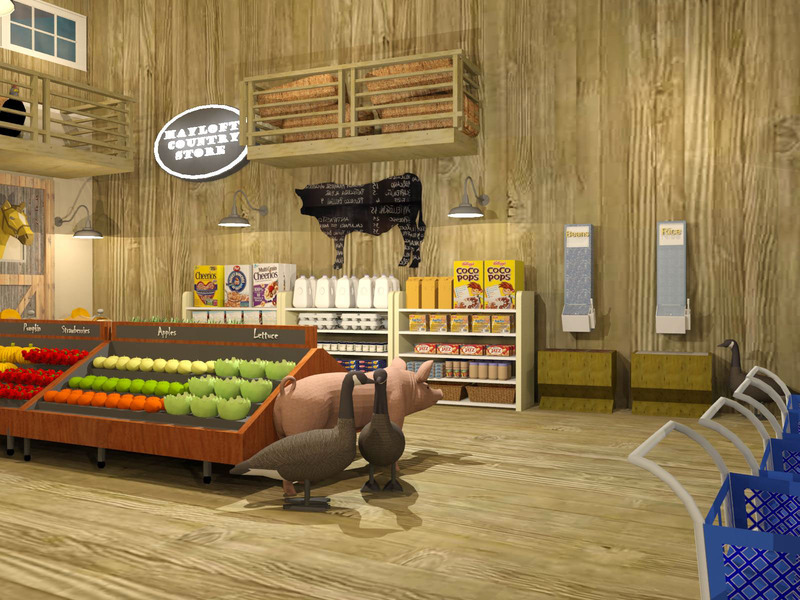 Hayloft Country Store is the grocery themed environment within My Happy Place facility. Custom rug pattern for Fireworks viewing area within the Happy Place Facility. The rug acts as not only a interesting area for children to play, but as a place-holder for wheelchairs during the fireworks viewing sessions. Fireworks Viewing Area - The tree mural screen retracts from the windows during the fireworks at The Magic Kingdom. Autistic children have sensitive hearing but love to see the fireworks. 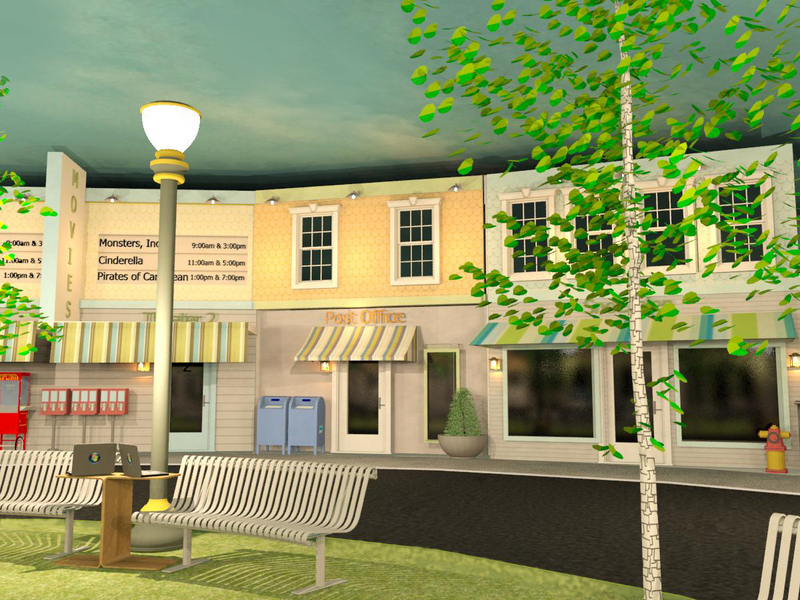 This area offers them the opportunity to view the fireworks from a comfortable space. After the fireworks are over, the screen returns to keep the themed environment authentic. 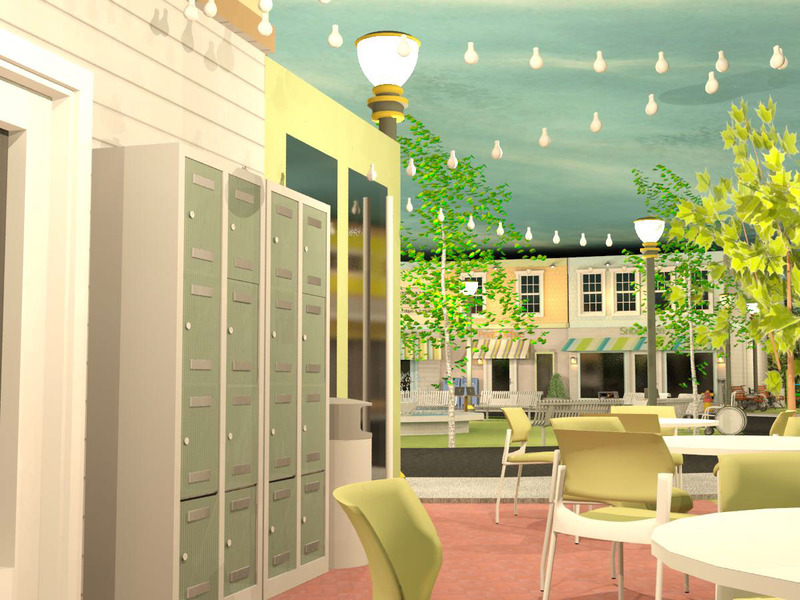 Outdoor Cafe Area - As many autistic children have limited food palates, refrigerated and locked storage is provided for parents. This accomodation may also provide a place to store medicine while visiting the park. 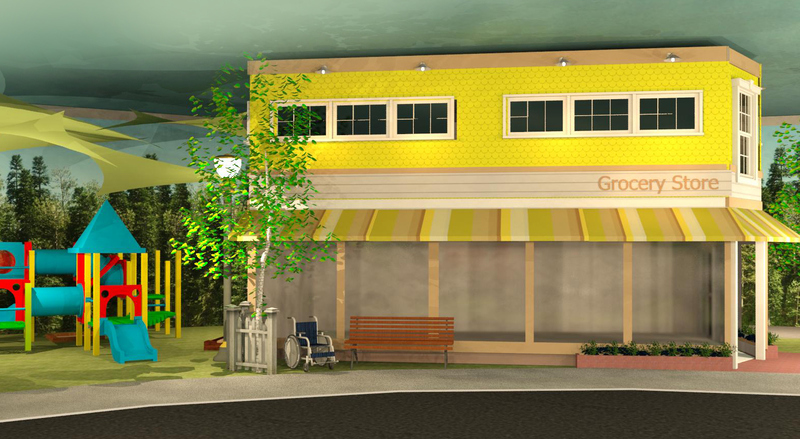 Exterior of Treehouse Cafe. 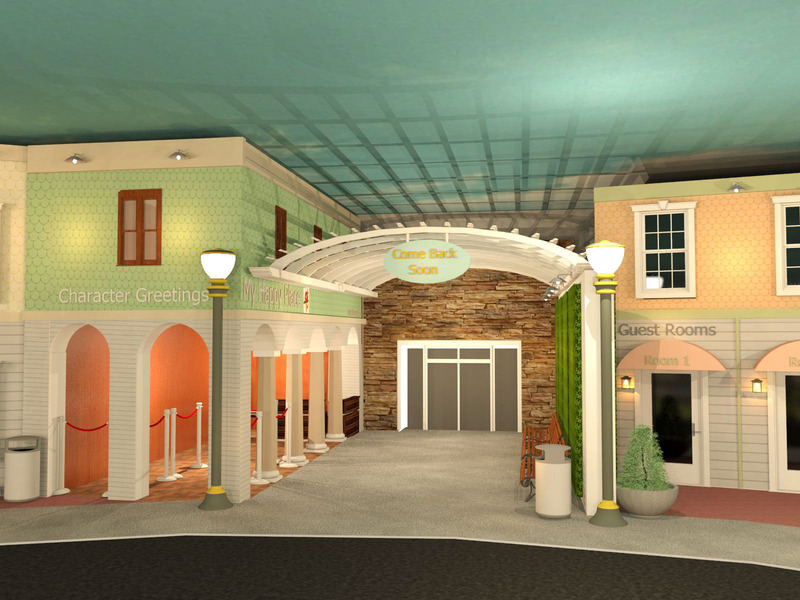 By creating a "sidewalk" and a "road," wayfinding has been considered for the mobile guests on the sidewalk and the wheelchair guests on the "road." Restroom and Shower building within My Happy Place Facility. 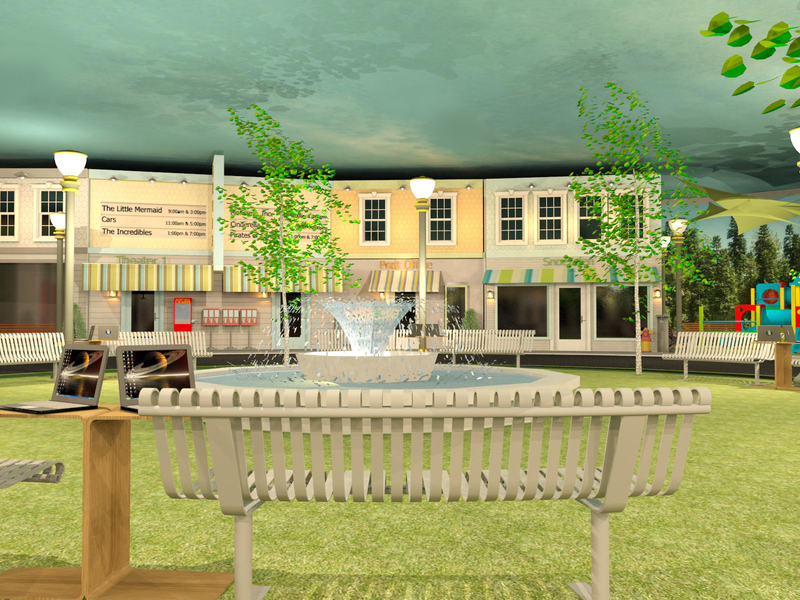 The center of My Happy Place Facility has a quiet park area with a soothing water feature. This area also has Internet connection and laptops available for children or family members to use while they are waiting for others within the facility. 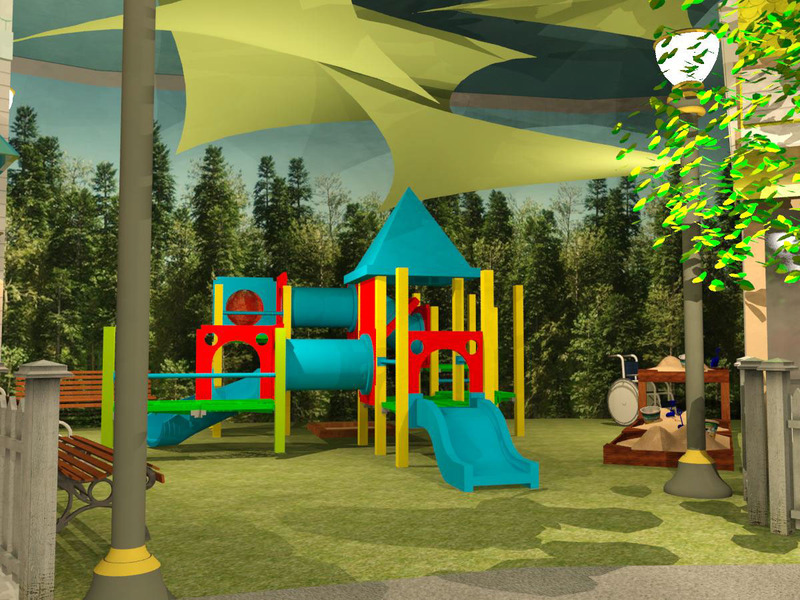 This space promotes indepedence of the autistic guests to explore the facility without being accompanied, but also provides assurance to the parents that the children are within an enclosed facility. The parents have a good vantage point of all spaces from that centralized location. Preliminary Sketch of Ceiling. 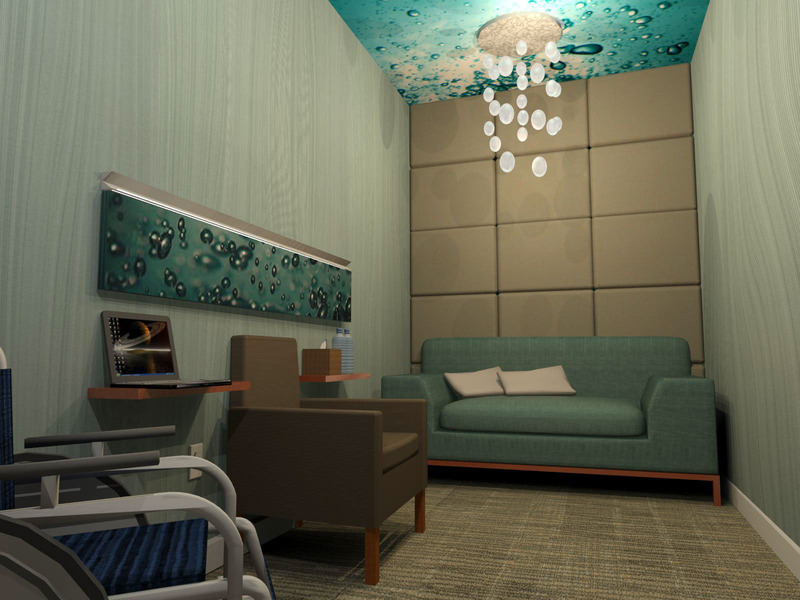 My Happy Place Facility has a stretch ceiling that has projected clouds to create a space that is authentic. 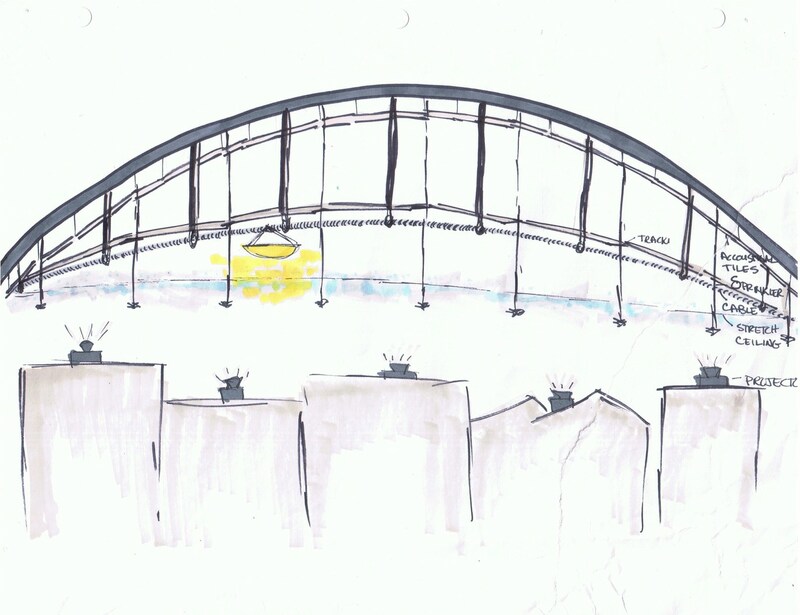 The orginal idea was to have a cable system to drag a "sun" lighting fixture across the sky to resemble accurately the time of day. The final Autocad drawing depicts the lighting system as small LED lights affixed to the track and the lighting slowly progresses across the track throughout the day to simulate sunlight. The addition of fiber optic tubing throughout the ceiling (all connecting to two transformer boxes) simulate the twinkling of stars during evening hours. The acoustical panels were also replaced with a spray thermal accoustical finish. Fire sprinklers are brought through the mesh ceiling at the appropriate footage within the space. Lighting is kept at a low wattage so it is tolerated by the guests. 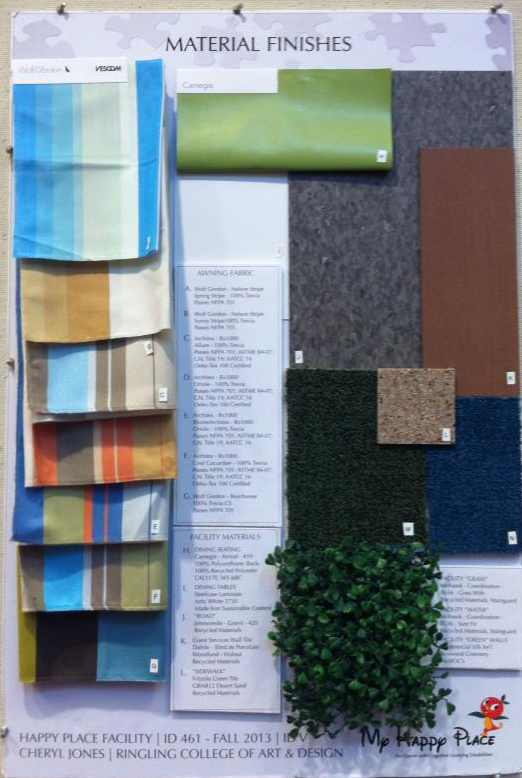 Materials for the common areas of My Happy Place Facility.